St Madeleine Sophie was born two months premature in Joigny, France. It is said that a terrifying wildfire caused her mother to go into early labour. She was baptised the next day because of fears that she would not survive. Her parents were reasonably wealthy; her father owned a vineyard and made wine barrels. She had an older brother and sister. When St Madeleine was 9, her brother Louis, who was then a Deacon, started teaching at the local school and, noticing how bright Madeline was, took her under his care. She excelled in all her studies, outperforming her contemporaries and her brother’s male students. However, the French Revolution interrupted all normal life. Within a short time frame, Louis, now a Priest was imprisoned in Paris and Madeleine’s education was stalled. In 1795, through the intervention of a friend, Louis avoided execution and was released. Although he returned home, accompanied by St Madeleine they soon returned to Paris and lived in a safe house. He continued to perform his Priestly duties while St Madeleine resumed her studies. St Madeleine had always wanted to become a nun and join the Carmelite Sisters but they, like most other religious orders, had been abolished. 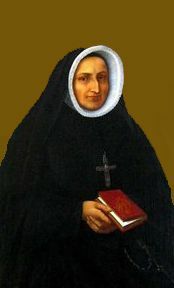 That didn’t stifle her ambition and together with her brother and Fr Joseph Varin, they created a women’s order devoted to The Sacred Heart of Jesus, the education of young women and the poor. In 1806, at the age of 23, St Madeleine Sophie was elected Superior-General of this new Society. Today there are more than a hundred Sacred Heart schools worldwide. St Madeline’s Feast Day is the 25th May. Pray for us that we will persevere against all obstacles that befall our way in life.